Round kumquat is a native of China. It bears quite attractive small round fruits which can also be eaten. Therefore it is cultivated in home and other gardens all over the world as an ornamental plant. Evergreen shrubs or small trees, usually 2-4 m tall, branches angular when young, rounded when older, sometimes with single axillary spines. Leaves simple, alternate, lanceolate, upto 7 cm long, blunt at the tip, finely toothed from the apex to middle, dark green, densely glandular-dotted, especially on the underside; petioles often narrowly winged. Flowers borne singly or in few-flowered clusters in axils of leaves, hermaphrodite, 5-merous, small, white, sweet scented; stamens 16 or 20(-24), cohering irregularly in bundles; stigma cavernous within because or large deep-seated oil glands. Fruit globose, 2-3 cm in diameter, style caduceus, 4-7-segmented, peel thick, fleshy, aromatic, bright orange or golden yellow. 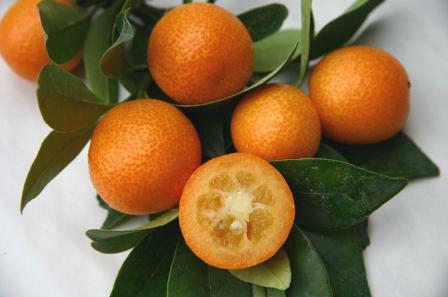 The round kumquat is a globose golden-orange fruit. The pulp is acidic, but the rind is sweet. The fruit, when eaten fresh, is eaten with its peel. Like other kumquats, this fruit is rich in vitamins A and C, and contains good levels of pectin, and is often transformed into marmalades. 100g edible portion (rind included) of round kumquat contains, water 89g, protein 0.9g, carbohydrates 5.5g, cellulose 4.1g, ash 05g. The energy value averages 290 kJ/100g. Besides being eaten raw, round kumquat fruits are also cooked and made into preserves. These are also used as flavouring. Since the fruit is rich in pectin, so it makes excellent marmalades and jellies. The plant is antiphlogistic, antivinous, carminative, deodorant, stimulant. The leaves and fruit contain an essential oil, whilst the fruit also contains sugars and organic acids. Fresh fruit is antitussive and expectorant. In Vietnam it is steamed with sugar candy and used in the treatment of sore throats. They also consider it to be very good for infants. Round kumquat prefers a moderately heavy loam with a generous amount of compost and sand added and a very sunny position. Plants are sensitive to water logging[200. This species is not hardy in the colder areas of the country, when dormant it tolerates temperatures down to about -5° C. The young growth in spring, even on mature plants, is frost-tender. 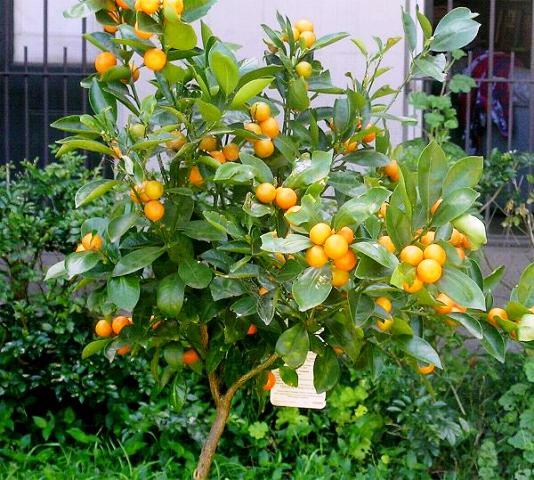 Kumquats are widely cultivated in China for their edible fruit, there are many named varieties too in that country.